This was actually the first Custom Content I made for the Sims 4! A few months ago I revisited it and redid all the textures. Awesome mesh from starkknaked on Tumblr required. Yeah. That particular Tumblr account is closed down for whatever reason. 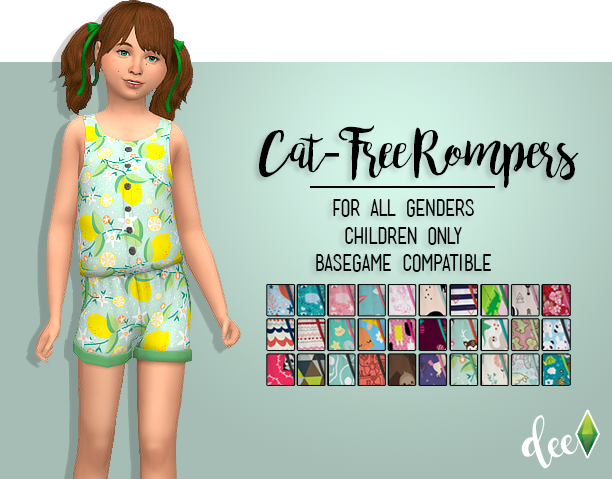 I managed to find it on her new Tumblr account using google - https://simslikeus.tumblr.com/post/129230557633/starkknaked-anyong-pussycat-my-romper-for I hope that helps anyone who stumbles here that little extra hassle.